Richard Gere outdoes himself as a classic urban character. Richard Gere (left) and Lior Ashkenazi go shopping in Norman. Most American urban dwellers have encountered a man like Norman Oppenheimer, the protagonist of Joseph Cedar’s Norman. He’s the guy who can take care of a traffic ticket, or knows somebody at City Hall that can get you that permit. The guy who wants to introduce you to his cousin and his can’t-miss business opportunity. He exists in the big-city landscape somewhere in the space between a spare-change hustler and your obnoxious, sponging brother-in-law. Norman is a fixer, hence the movie’s subtitle: The Moderate Rise and Tragic Fall of a New York Fixer. Norman is also specifically, unmistakably Jewish. It’s part of the moral thrust of his story as well as the narrative through-line. The fixer is a well-known character type in urban folklore, always spinning a line, usually to his own advantage. 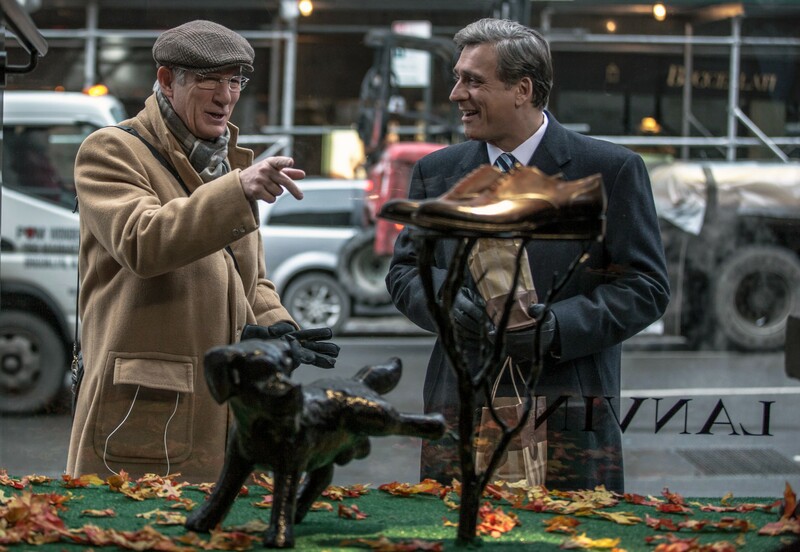 So when Norman (played by Richard Gere), in his excessively bundled-up winter outfit of worn-out overcoat, scarf, cap, and briefcase, importunes Israeli politician Micha Eshel (Lior Ashkenazi) on a Manhattan street, talks him up, and impulsively buys this complete stranger an expensive pair of shoes, we assume that both of them are aware of the rules of the game. Somebody is getting the shpritz, being hustled, getting set up for a proposition. The point of writer-director Cedar’s funny, touching, wondrously forgiving fable is that despite what it seems, Norman is not out to rip off Eshel, or to try to peddle influence. Norman is really performing a mitzvah, a religious good deed. And of course no good deed goes unpunished. Cedar, director of the thoughtful Israeli war story Beaufort, specializes in dramas of moral investigation. Here, the story arc follows Norman through an escalating series of business/political miscues, from those he talks others into, to those he talks himself out of. Regardless, he’s the one doing most of the talking. Gere outdoes himself in the part. Now, at age 67 with the “pretty boy” roles behind him, Gere can afford to stretch out in such films as the recent Time Out of Mind, portraying a homeless man trying to mend his tattered life. In Norman the goal is nothing less than righteousness for its own sake, and Gere makes us believe, in a career performance. He’s backed up by a thrillingly well cast ensemble of actors, led by Israeli movie star Ashkenazi (Hello, Goodbye) and including Michael Sheen and Steve Buscemi – both playing Jewish, Buscemi as a rabbi, no less – alongside Charlotte Gainsbourg, Harris Yulin, Neta Riskin, Hank Azaria, and Josh Charles. Together with Gere, they etch a tale with endless precedents but limitless possibilities. Other films with similar flavors come to mind: The King of Comedy, American Hustle (especially in the dramatic framework), Being There, Edgar Ulmer’s Yiddish-language Americaner Shadchen, Preston Sturges’ The Great McGinty, and It’s a Wonderful Life, among others. Norman Oppenheimer is the Rupert Pupkin of deal-makers. To know him slightly is to know him well, but even those who know him well know almost nothing about him. We never see where he lives, let alone meet someone who loves him. Fellow loner Pupkin’s maxim from The King of Comedy rings in our ears as we observe the convolutions: “Better to be king for a day than schmuck for a lifetime.” Norman’s aim is higher. King Solomon, maybe. The film is humanistic but spiritual, with abundant comic overtones, yet serious as mortality. In the film’s press notes Cedar discusses the literary archetype of the Court Jew, and Cedar’s proposed film about the maker of the Third Reich hate film Jud Süss. We’re happy Cedar abandoned that project. Much better to spend our time contemplating Norman Oppenheimer, lonely and pathetic as he may seem. The thing he “fixes” is our desire to recognize a genuine everyman, a luftmensch afloat in the vastness of the human experience, with a crooked smile on his face. Norman is highly recommended.